This Diwali, we planned to visit the Alibaug beaches. A friend suggested that it’s better to visit nearby Kashid and Murud-Janjira, as the waters are cleaner and sands are cleanest on ghats. I browsed through the Google, and found the suggestions real true. One of my seniors, hailing from IIT-B, even told me that it’s actually white color fine sand/silt beach at Kashid (Geologists’ can’t resist), and the beaches are not very much crowded. We were also advised to witness the sunset at Kashid beach. 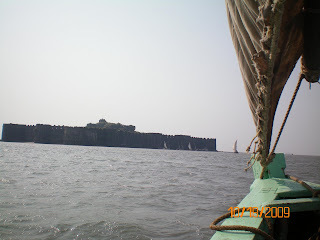 Sooooooo, we were total 8 people, (3-me n my 2room-mates + my 3 frns + frmz’ 2 frns) for the day-long tour-de-Kashid-Murud-Janjira! We hired an 8-seater Tavera, and the driver was in his handsome 19, though very coooool n calm on steering. We started at about 9AM from Ghansoli, Navi Mumbai and reached Kashid beach at about 11:30. The beach was so fascinating and inviting that we couldn’t control and run towards it! 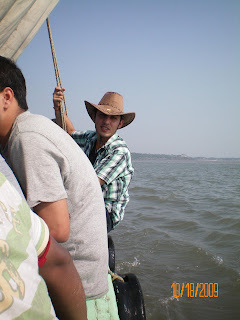 Bought tickets, got into the old-style sail boat, and started for about 10mins journey towards the fort. Though, on public domain we came to know that the fort is about 2km from the port, it didn’t appear so. We reached thr in mins, and truly didn’t find it very exciting. It was an old fort, like all other forts, ill-managed, without any potable water and having locked-toilets! We spent some time there, and then returned. Best thing we found there were sea-shells! 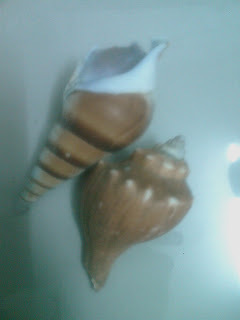 Itz very easy to get some good conches there, I too collected a few. Most of them were alive, so had only two with me...rest thrown into the waters. On our way back to Kashid, we had lunch at about 3PM in a ‘good’ restaurant of Murud...which turned out too bad! Everyone’s mood was screwed after that food, few of us who ordered beers were given some jus-cold ill-known thing. Guys were so exhausted that they took those, and ended with more frustration. Leaving it, we came again to the beautiful Kashid beach....sun was ready to dip into the Arabian Sea...the view was awesome! 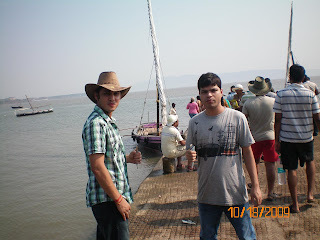 Some frnz tried to get snapped with diving sun...and some others including me....ran towards waters! It was low tide time, so we could get little more inside and even felt the basalts below our feet. 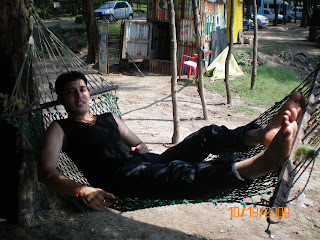 Had great masti there...playing water-polo with someone’s tee and splashing waters on each-other. 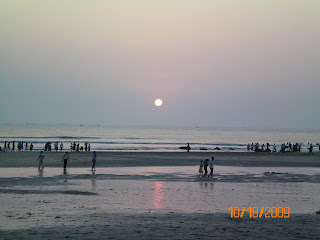 The beach is not as good as the Eastern coasts' beaches, but it’s the best I ever visited in and around Mumbai! Okay for now, will keep posting my earlier and future trips....cheers!